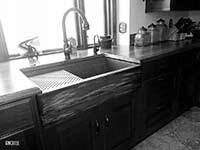 Copper Sink Information Rachiele sinks I hope you will consider joining our family of custom sink owners. I look forward to working with you. Don't drive while intoxicated. Don't buy a cheap copper sink. How well do copper sinks hold up over time? Well, it depends on who made the copper sink! Ever changing beauty inside the bowl. Interior will always return to the color of an old penny. Bottom of sink will change to a different color than the rest of the sink. Copper sinks hold their value. We have sold used copper sinks for 70% of their original value. 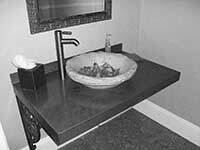 Imported copper sinks are nothing special, hence they do not hold value when used. Copper sinks do well with hard water and well water. 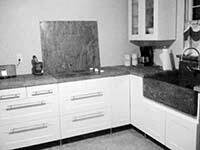 Hard water may damage the finish of an imported sink. Precision built Can be as much as 1/2" off - per "their" disclaimers. Use the sink like a sink Use their sink like a car - wash, dry, wax. Rachiele has everything you need to create an awesome kitchen Shop Now!